Wrist pain is no fun, but many hand orthoses can ease pain and reduce recovery time. We see patients with various hand issues. Your hands are important for all of your daily activities. The definition of orthoses as published by www.freedictionary.com: from Greek ortho, to straighten. Custom-designed external devices used to control or counteract the effect of an actual or developing deformity. If you have any of the following hand issues, we can help! Most hand braces do need a prescription; contact us with any questions and we can find the best brace for you! WRIST SPRAIN – An injury to the ligaments of the wrist. This is typically caused by overuse or a fall. Surgery is typically not required. FRACTURE (RADIUS/ULNA) – The radius and ulna are the two long bones that make up the forearm and form part of the wrist. A fracture to these bones is caused by a traumatic force place on them (typically caused by a fall onto the wrist). Most fractures are placed in a cast before graduating to a wrist orthosis. GAMEKEEPER’S THUMB (Ulnar Collateral Ligament) – The ulnar collateral ligament (UCL) of the thumb is at the base of the joint. Gamekeeper’s thumb is the stretching or tearing of the ligament due to traumatic force placed on the thumb. Surgery is usually not need; a brace and rest maybe enough to aid in the healing of the ligament. 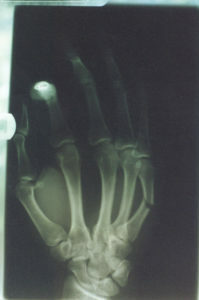 SCAPHOID FRACTURE – A Fracture of the navicular bone at the base of the thumb. Immobilization is key for this injury to heal. If the fracture becomes displaced (moved), then surgery maybe needed to pin the bone in place. If surgery is needed, a cast maybe used before being placed in a thumb orthosis. DEQUERVAIN’S TENDINOSIS – Caused by inflammation of the tendons at the base of the thumb; brace may be used in conjunction with rest and/or cortisone injection (administered by a physician). CARPAL TUNNEL SYNDROME – An irritation of the median nerve that runs through the volar side of the wrist (palm). Carpal tunnel syndrome may cause numbness and tingling in the hands and fingers. You may also experience weakness in the hand as well. Depending on the severity of your carpal tunnel, a physician may went to perform surgery. METACARPAL FRACTURE – A break to the bones of the hands. Our specialists can answer questions about your wrist/hand injury. Just call us or complete our contact form and we'll get back with you within 24 hours.